Hawaiian engagement rings are appropriate choices when either the bride or the groom has Hawaiian ancestors or other connections to the tropical islands. Also if, the couple vacation in Hawaii frequently, met on the islands, or plan to honeymoon in Hawaii, a ring inspired by the islands will help to remind them about their memorable day and their commitment to one another. Hawaiian rings are nontraditional, so they sometimes make better promise rings than wedding or engagement rings. A groom should know about their bride’s preference before purchasing such a unique selection. Hawaii is one of the most popular locations for a destination wedding. The islands have a rich heritage that go back for centuries, despite only being a state in the nation for just over 50 years. The flowers, pristine beaches, beautiful volcano, and colorful sunset create a tropical paradise for couples and produce a romantic vibe that couples want to bring into their wedding. Hawaii sparks images of beach weddings, honeymoons, and tropical engagement proposals, and many couples desire to capture those images into a symbol that can be carried with them throughout their relationship rather than just on one memorable day. The cost of Hawaiian engagement rings or wedding bands will depend on the types of materials and gemstones used. Diamonds will cost more than pearls or other stones, and bands with higher karat gold will also drive up the price. Rings may also need to be purchased at an independent jeweler, as many leading retailers in states other than Hawaii probably do not carry Hawaiian designs. If any particular engraving needs to be done, that will also increase the cost of the ring, to an extent. To get an authentic Hawaiian design, shoppers may also want to contact a designer that is based out of Hawaii. This may increase the cost of the piece. Because of the uniqueness of Hawaiian jewelry, sometimes Hawaiian inspired engagement rings and wedding bands are difficult to find. However, many online jewelry stores, such as Na Hoku (www.nahoku.com) and GiftsHawaii.net, offer a variety of designs to view. These online stores give the customer easy access to a variety of different designs so that they can choose the perfect ring for that special someone. On the Na Hoku shopping site, shoppers can find a variety of traditional engagement rings ranging up to $10,000 in price. In addition to these pieces, there are also a variety of engagement rings and wedding bands that are influenced by Hawaii. The store features a white gold maile leaf ring with a ½ carat center diamond. Maile leaves are traditionally used in Hawaiian leis. The ring is moderately priced at just under $3,000. For wedding rings, Na Hoku also offers a variety of different Hawaiian designs. The site features rings in rose gold and yellow gold with mother of pearl inlays and diamonds. Other more inexpensive designs feature plumeria rings, one which can be purchased for under $400. Others yet have whit gold bands with maile leaf patterns, flowers, palm trees, sea horses, and other marine life. Shopping sites like Amazon.com also feature some Hawaiian inspired engagement rings and wedding bands and discounted prices. One such item featured on the site is a 1.0 carat cubic zirconium Hawaiian Heirloom engagement ring in sterling silver. This particular ring is hand engraved with Hawaiian scroll and features an authentic plumeria flower design. It is made right in Hawaii at the Hawaiian Heirloom Jewelry Factory, and it sells on the site for $75. Giftshawaii.net offers six different Hawaiian engagement rings with center diamonds. Two have Hawaiian French mounts in yellow gold and come with ½ ct or ¼ ct diamonds. The others featured Hawaiian scroll and flower hand engraved designs. Some also have custom black enamel borders on the outside of the ring. The engagement bands offered on this site feature either one, three, or five plumeria flowers in 14k gold, and the prices range from $204 to $293. 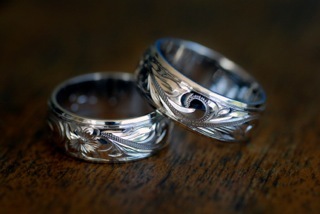 This jewelry retailer, which can be found online at Inspiredsilver.com, features a Hawaiian inspired wedding set. The two bands are made of platinum and fit together to make a classic Hawaiian wave combination. The solitaire is ¾ carat diamond, and the wedding band totals ½ diamonds, with several diamonds traveling down the sides of the band. Wedding band sets can also be found at Hawaii City. Designs can be found in white gold, sterling silver, yellow gold, and rose gold. Each ring set can come in the buyer’s choice of eight different designs featuring different leaf, scroll, and flower patterns. Engraving is also available on either the outside or the inside of the ring to personalize the piece. Some of the rings also offer double or triple band design work. The Hawaiian Islands inspire many different, unique and distinctive jewelry pieces, especially engagement rings. Flower engagement rings are especially popular. Hibiscus is the state flower of Hawaii, so they are often used along with plumeria flowers. These flower designs offer incorporate colorful gemstones to make up the petals and leaves. Pink diamonds, rubies, topaz, jade, or emerald gems are all options. While round and oval stones are typically the most common shapes, marquise shaped stones with pointed tips make reasonable leave shapes. Figural rings may also use Hawaiian designs, like palm trees, sea turtles, whales, dolphins, or other marine life. Figural jewelry is crafted to represent a definitive form, like an animal or other natural object. This style of ring often incorporates pave or channel settings, as well. Pave settings literally pave the ring’s band with diamonds to give the illusion of solid diamonds rather than a metal band. Channel settings arrange diamonds into a line that is laid within the ring’s band. Both of these settings take focus away from the one center stone. Pearl engagement rings can also represent Hawaii, especially if the pearls are harvested on the islands. The most popular color of pearl is the creamy white with luminescent coloring. Pearls also come in a variety of other colors, including black, gold, blue, pink, cream, and green. Black pearls can also symbolize the black-sand beaches of Hawaii. Pearls are less expensive than traditional diamonds, but engagement rings featuring pearls can actually be more expensive than a traditional diamond ring. Pearls can be more difficult to set, and they also typically feature many accent stones. Engraved engagement rings can also gain a Hawaiian feel by engraving such accents as waves, sea life, flowers, and bamboo. This can either be performed on the inside or outside of the ring. This is a neat way to personalize a wedding band, especially men’s rings, as they typically tend to be pretty straightforward. Simple engraving is also relatively inexpensive, so it makes for an affordable way to personalize a ring that may not originally be Hawaiian inspired. Because of this personalization, engraved rings are often nonrefundable and nonreturnable. Since 1971, Phillip Rickard has been creating custom Hawaiian jewelry in Honolulu. Currently he has five retail stores in the Hawaiian Islands, and he has become one of the premiere manufacturers of world class Hawaiian jewelry. His wedding rings are supposed to represent the Hawaiian wedding and feature leis and tropical flowers that are typically exchanged as the centerpiece of the wedding ceremony. Some of his designs include the Komo Kula, Niho Niho, Kui Lima, Palau, and Uakea. Two of the bands, the Haku Leilani and the Haku Lei offer multicolored designs. The band is made of platinum, but the flowered design features colors of yellow, green, pink, white, and gold. Since starting to design jewelry in 1981, Denny Wong has won multiple awards and has been recognized for his work by the Hawaii Jewelers Association. Rings can be found in many of his collections, including a 14 karat white or yellow gold hibiscus flower and many varieties from his plumeria flower collection. All of his pieces also come with a lifetime guarantee. Local artist Wendell J. Signson was born and raised and Hawaii. He specializes in creating pieces that embody the spirit of the islands. One of the most popular pieces is the 14 karat white gold maile eternity ring. This ring features a traditional maile leaf interwoven with a band of sparkling diamonds. The Maile Windsong ring also features cascading maile leaves interlaced with diamond studded golden crescents. Hawaiian engagement rings and wedding bands require the same care as any other gold jewelry. It should be kept clean. The ring should be removed when a person is using harsh or abrasive chemicals. The person should avoid situations that could scratch, dent, or warp the metal. When cleaning gold rings, a mild dish detergent should be used, and the piece should be gently scrubbed using a toothbrush to remove all dirt and oil. Hello, i just wanted to know if you had a store in honolulu that we could go to and pick out our rings rather then ordering it online.. I wanted to know where I can find the rings pictured on the Hawaiin Wedding Rings section. I have searched all the websited listed, but could not find the same ones, please help.